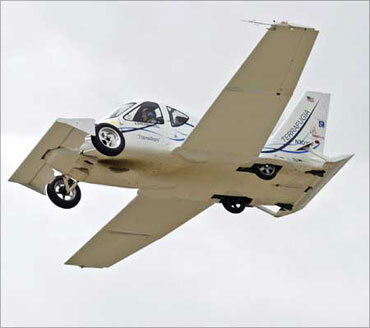 If you are dreaming of a car that can also fly in case of traffic jams, it could soon come true as the United States aviation authority has given its green signal for the commercial production of such a vehicle. 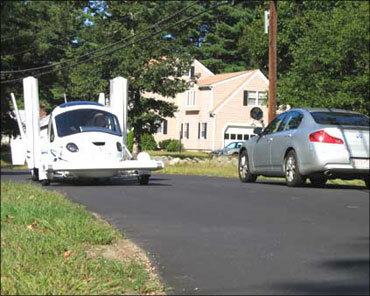 The vehicle 'Terrafugia Transition' is a two-seater car that can convert from road to air in less than a minute, without the driver leaving the vehicle. 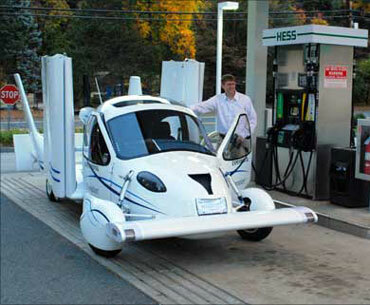 Developed by former NASA engineers and built by a small American company from Massachusetts, Terrafugia Inc, the vehicle can travel at speeds of up to 90 mph in car mode with its wings folded. The wings then unfold for flight mode in which it can cruise at a speed of 115 mph for up to 500 miles on a tank of unleaded gasoline, the Telegraph reported. The US Federal Aviation Administration (FAA) has granted the Transition an exemption -- allowing it to be classified as a 'light sport aircraft' despite being 120 pound over the limit. 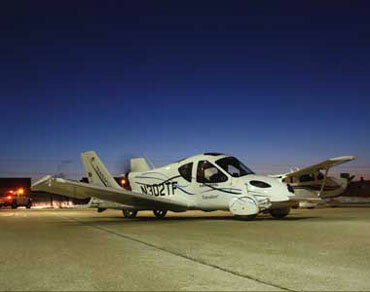 Image: The Terrafugia Transition taxiing to the runway. The 'roadable aircraft', which is powered by the same 100-bhp engine whether it is on the ground or in the air, will require a 'Sport Pilot license' to fly. It can take off or land at any public use general aviation airport with at least 2,500 feet of runway. According to its manufacturer, one of the major advantages of the Transition over ordinary light aircraft is safety, as in the event of inclement weather, it can simply drive home instead of either being grounded or flying in unsafe conditions. With a deposit money of $10,000 (Rs 460,000), nearly 70 people have already booked the car which is expected to cost $194,000 (about Rs 90 lakh), the company said. Founded in 2006 by award-winning Massachusetts Institute of Technology-trained aeronautical engineers and management whizkids, Terrafugia is a company with a mission: to provide innovative solutions to the challenges facing personal aviation. The result: the Transition Roadable Aircraft. 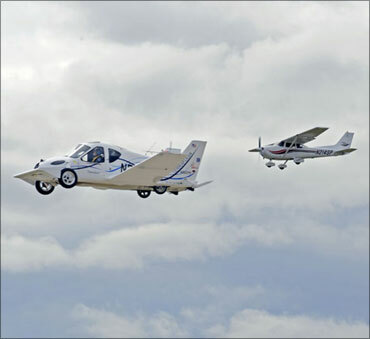 Image: Two Terrafugia Transitions in the air. 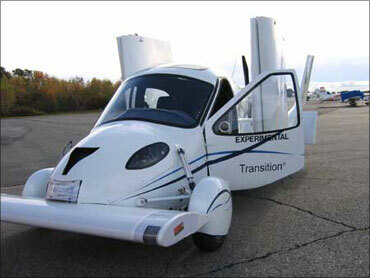 Its unique design allows the Transition to fold its wings and drive on any surface road with a modern personal airplane platform. Once at the airport, the wings extend and the aircraft is ready. Powered testing of the Proof of Concept has been ongoing since the second half of 2008. Construction, testing and certification of the Production Prototype will follow completion of the Proof of Concept's testing programme. To date, Terrafugia remains privately funded by a group of accredited individual investors. The company is based just outside Boston in Woburn, Massachusetts, USA. 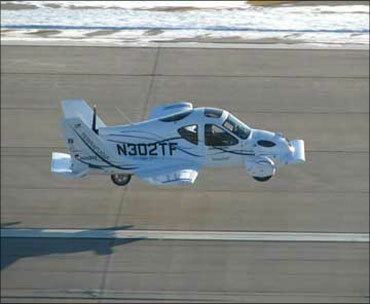 Terrafugia Transition can take off or land at any public use general aviation airport with at least 2,500 feet of runway. On the ground, the Transition can be driven on any road and parked in a standard parking space or household garage. Once on the ground, with the wings folded, the vehicle can be driven on any road. The Transition is powered by a certified aircraft engine that runs on unleaded automotive gasoline. Perfect for trips between 100 and 500 miles, the Transition is not designed to replace anyone's automobile. After landing, the pilot activates the electro-mechanical wing folding mechanism from inside the cockpit. The wings fold, once at the root and once at the mid-span, and are stowed vertically on the sides of the vehicle in less than 30 seconds. Simultaneously, the engine power is directed to the front wheels with a continuously variable transmission. Before flying, the pilot extends the wings and performs a standard preflight. The engine power is directed to the propeller for flight through a carbon fibre drive shaft. If bad weather is encountered en route, the pilot can land and drive without worrying about ground transportation. At the destination airport the pilot can fold the wings and drive off the airfield without having to move bags or arrange for additional transportation. Driving and flying can be combined between multiple airports as it is not necessary to take off and land at the same field.